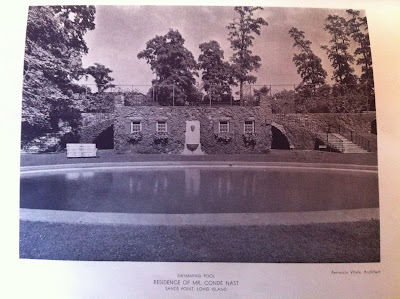 The Ferruccio Vitale designed swimming pool to 'Sandy Cay', the Conde Nast estate built c. 1930 in Sands Point. Click HERE for more on 'Sandy Cay'. Looking at the photo of ‘Sandy Cay’ that Zach posted on February 7, 2011 it appears the newer, really large house that sits on this property now was built on the footprint of the Conde Nast house – I’m using the small, round garden pool as a reference point & Bing: http://www.bing.com/maps/?v=2&cp=qt8kzc8vprvp&lvl=18.924674318520765&dir=4.54829646222742&sty=b&where1=Sands%20Point%2C%20NY&q=Sands%20Point%2C%20New%20York&form=LMLTCC Unfortunately, the newer owner also removed all landscaping between the house & garden pool, making a nice lawn but not anything you might want to stroll through. 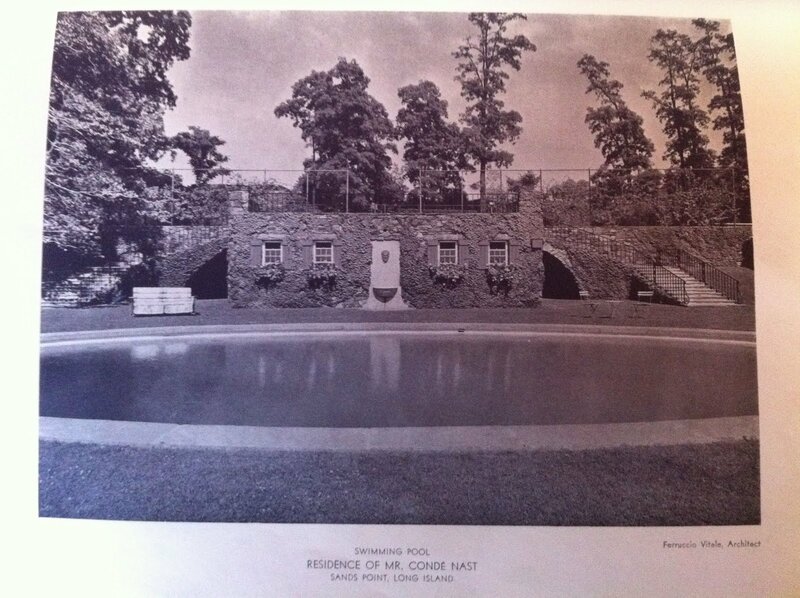 Comparing the picture Zach posted today of the Conde Nast swimming pool, pool house, & tennis court (which sat above) to the Bing view it appears everything in this picture has been removed & replaced by lawn. The Bing view of the half circle retaining wall with the garden above it seems a little too far to the east to be part of today’s photograph. Too bad because, to me, a house this large with this much available acreage has no reason to have a swimming pool shoved up against it like what is there now … just like, again to me, you should not be able to stand at the front door of a house like this with this much land & look straight at your garage doors ... but that's just me. Did I say too far to the 'east'? ... I meant south ... I rotated in Bing but not in my head, sorry. You anticipated my request for a Bing link to the new house. Thanks! Despite the impracticality, I love round and oval swimming pools, especially when they can be view from a higher aspect. And grass right up to the coping is a great aesthetic feature -- if there is staff to maintain it. My country pool is about 100 yards from the house, but I can see many good reasons for having one closer -- old age, a disabled child, fencing requirements, etc. i'm assuming the tenny and pool were not consumed by the fire so why did they demo them and leave a boring and not too well taken care of lawn. i think this pool is the bees knees. amazing tho how fast houses come and go in sands point. this one evidently wouldn't sell and so lasted 24 years, beacon tower about the same - WTF and yet here in the colonies we're stuck with trailers 60 years old. there is no justice. at least this house has some minimum landscaping altho i am hearing a familiar whining noise which, altho not voice yet, i would guess is coming from the direction of Blue Hill, Maine and is generated by all that tar in front of the house and, in this case i would have to concur. put the freaking car in the garage not in front of the house. nouveau -tsk, tsk, tsk!